Today was our fifth day on the move and we planned to travel through the famous Tateyama Kurobe Alpine route to reach Toyama on the other side of the Japanese Alps. Luckily for our stamina levels we were scheduled to slow down a bit for the next week and would be staying in each hotel for two nights each. The Tateyama Kurobe Alpine Route is an incredibly scenic mountain crossing between Ōmachi in Nagano prefecture and Tateyama in Toyama prefecture. The entire route first opened in 1971 and uses a variety of different transportation modes over its thirty seven kilometre length. Trolley buses, cable cars, highway buses and a ropeway are used to traverse a total vertical interval of nearly two kilometres and are constructed as a way to minimise the environmental damage with many sections located entirely within tunnels. On the Toyama side of the mountains a train transports passengers between Toyama City and Tateyama, while on the Nagano side a bus is used to connect Ogizawa to the main JR railway line at Shinano-Ōmachi Station. The main attractions along the route include hiking and sightseeing in the spectacular Chubu Sangaku National Park, seasonal attractions such as autumn leaves, summer alpine flowers and in spring the famous snow corridors (which reach heights of up to 20m) as well as the impressive Kurobe dam, which is the tallest dam in all of Japan. The full journey for us from Matsumoto to Toyama involves nine transfers and around seven hours of travel time so we have therefore set our alarm clocks and have set aside an entire day for the experience. As mentioned last night, our hotel gave us an excellent view of the Matsumoto city and the surrounding mountains. After waking up we opened the curtains and admired the fantastic view and excellent weather we had once again been endowed with. The breakfast we had here at the Matsumoto Richmond Hotel was a success two nights ago and so this morning we once again went down to reception and purchased a breakfast coupon for 800 yen. From the pre-set menu Kate chose thesausages and eggs dish and I chose salmon with rice. We also made use of the included drink and salad bars. This morning I was brave enough to try the nattō that came with my dish. 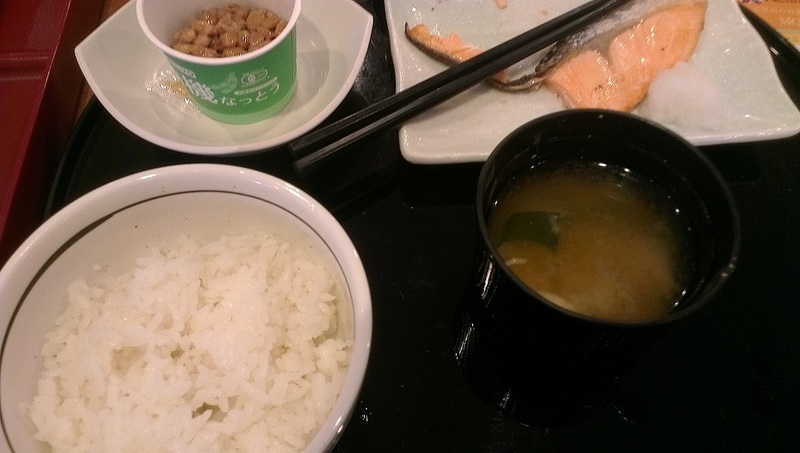 Nattō (納豆 = obtain + beans) are fermented soybeans and a popular traditional food Japan. They are eaten by about 85% of the population and enjoyed by 70%, figures that do not translate into international appeal. Reasons for this include its slimily and gooey texture, strong taste and a distinctive repugnant odour that has been compared to pungent cheese and smelly underwear. Nattō are considered to be a health food by the media and general population though there doesn’t seem to be any strong evidence that it’s better than other healthy food, such as soy beans in general. Anyway enjoying Nattō is often considered a sign of being a true Japanese person; much like Vegemite in Australia. I didn’t like them. The taste, smell and texture of the actual beans was not too bad but the stringy goo covering them was very off putting and I only ate a couple. After finishing breakfast we went back upstairs to get our luggage and check out of the hotel. The alpine route starts at Shinano-Ōmachi Station and to get there we had to drag our luggage down to Matsumoto station to catch, in our case, the 07:16 JR Oito line service. According to The Japan Book upon arriving we would still have some time until the next bus left which would give us plenty of time to sort out our luggage. As the route consists of nine different modes of transportation including ropeways, cable cars and feet, it would be quite impractical to lug our luggage along with us for the whole trip. Fortunately, there is a luggage delivery service available at the Alps Roman-Kan souvenir shop next to Shinano-Omachi Station and we planned to use it to send our luggage to the Tateyama train station on the other side of the mountains. This is the start of the final leg of the route and we thought we would easily be able to bring the luggage with us on the train. Aside from the alpine route service, baggage delivery (Takuhaibin = 宅 配 便 = home + distribute + convenience) in Japan in general is extremely well developed and it’s possible to send luggage from hotels and convenience stores (or get it picked up from wherever) to practically anywhere else in the country for only a small fee. For example, to send a 25kg suitcase from Tokyo to Osaka would cost around 1900 yen and to send it all the way to Hokkaido (around 1000km) would cost an extra 300 yen. It’s even possible to send cold and frozen items using the Cool Ta-Q-Bin service. Very convenient though we hadn’t actually used it yet as lugging our bags around with us has always worked out cheaper. Since there was quite a bit of time before our bus left, upon arriving at Shinano-Omachi Station we did not rush and just had a look around. The station area wasn’t really busy and we noticed a young Caucasian girl enter the Alps Roman-Kan to use the luggage forwarding service. We went over a little later and as we approached an old short (very!) lady came rushing out to meet us. She was pretty friendly, laughed a lot, and I practiced Japanese a bit speaking to her. We wanted to send our bags to Tateyama but she convinced us that it would be better to send straight to our hotel as it would be much more convenient and, importantly, the same price. The lady showed us a list of hotels in Toyama and asked us to point ours out, but it wasn’t listed. I told her that our hotel was called the Concept Hotel Wakyuu and, after a quick phone call, confirmed that they could deliver to that hotel. Once we had paid, the lady got out some tags and asked us to fill in the details. She was happy when I started filling it out in Japanese and I got a couple of "Jouzu". Still a long way to go then. After filling in the forms the lady attached them do our bags and started trying to move them to the back of the shop. I tried to help and warned that the bags probably weighed around 30kg, but she insisted on moving it all the way herself. Our bags were not much shorter than her so it looked like quite a struggle. There was no way she could do both at once though so Kate was able help by dragging her own bag after the lady. Anyway, despite our aversion to human interactions we found this lady to be very friendly, funny and fun to deal with. After we had sorted out our luggage we went to have a look to see where we could buy a bus ticket. Inside the station we saw some signs that indicated that you could buy a ticket for the whole route here. We decided not to at this stage but did pick up some pamphlets including one that told us about the various places you could buy dam shaped curry. I’ll explain a bit. At the Kurobe dam there is a rest host where you can buy Japanese curry rice which has been prepared to look like a miniature version of the dam. According to the pamphlet we had, restaurant shops in the Shinano-Omachi area had continued the idea and each had their own variation. We still had to get a ticket for the bus and as single tickets were not sold inside that station, we instead purchased them from a little kiosk next to the well signed bus stop to the left of the train station exit. The bus trip was similar to our trip out of Matsumoto few days ago and we were able to view rice fields, bubbling rivers and snow-capped mountains as we travelled up to the Ogizawa bus transfer station. Compared to the relative calm of the Shinano-Omachi station, Ogizawa was really crowded and most people were arriving on chartered buses as part of big domestic tours. There were two lines, one to buy tickets and another filled with hundreds of people lining for our next form of transportation, the Kanden trolley buses. Thankfully, since the tour groups had already organised tickets, the ticket line for us wasn't very long. Unusually for Japan though, everyone seemed to want to pay with a credit card and the line moved pretty slowly. It was possible to buy a ticket for the whole route here as well and we decided to do so in order to avoid having to line up again at each subsequent station. I think it came to around ¥9,230 (Ogizawa to Dentetsu-Toyama) and we were given a single ticket that had a QR code which was scanned before each trip. Ticket sorted, we joined the long line to ride the trolley buses. The route we were taking travels through a tunnel built by the Kansai Electric Power company (a.k.a. 関電 = Connection (From Kansai) + Electricity = Kanden) during construction of the Kurobe dam hydroelectric power plant. The buses themselves are quite special as they're one of only two trolleybus lines operating in Japan and were commissioned by Kanden to attract tourists to the scenic location. What makes them trolleybuses is the fact that they are electrically powered and get their energy from overhead power wires- much like a train or tram. I hadn't actually heard of anything like them before but they're apparently not uncommon in large European cities. In fact, we even had a couple of lines here in Brisbane in the 50's and 60's! Anyway, despite the large queue it wasn't long until it was our turn to ride the buses as they had quite a large capacity. We didn't get on the first convoy but were toward the front of the line when the next set showed up. There were about four or five buses to choose from and we walked quickly down to one of the far ones to make sure we'd get a seat aboard. I was fascinated by the overhead wires and connecting trolley poles. Unlike trains and trams there were two independent poles running up to the overhead wires. This is because a circuit is needed and the reason trains (and trams) can get away with only one is that the metal tracks can be used to complete the circuit instead. The buses leave at the same time from both ends and travel in strictly timed convoys since the tunnel is only one lane wide for the majority of its length, widening only in the middle so buses travelling from the other direction can pass. One thing we immediately noticed once we found a seat inside was that the interior of the bus absolutely reeked of naphthalene. This is the chemical used in mothballs and is responsible for their characteristic smell. Naphthalene is an aromatic hydrocarbon composed of two fused benzene rings and can apparently be detected in concentrations as little as 0.08ppm or one part in 12,500,000- that's a very low concentration! I'm actually not sure if ‘detectable’ here means by a senor or the human nose but let me tell you, in that bus it was detectable by our tongues. And our eyes with their watering. Honestly based on the smell alone I'd prefer to deal with the moths. Like most other things in life Naphthalene has been classed as a potentially carcinogenic substance and we could almost feel the cancer develop. Yee gods I digress. And perhaps exaggerate. Though I do worry about the bus drivers as the exposure would be constant for them. The first part of the route consisted of a little bit of an outdoor road leading up into a tunnel in the side of the mountain. The buses were not joined in any way to each other and moved independently. The tunnel was pretty tunnelly and not much happened apart from passing the other buses half way along. They looked much less crowded than ours, which is probably due to the fact that it was still too early for those who were travelling the alpine route in the opposite direction to have come this far yet. The few people we did see on these buses must have therefore stayed overnight at one of the hotels along the route. The buses also had narration in Japanese though I cannot recall what was said. After about fifteen minutes the buses pulled up at an underground station at the end of the tunnel. Well, it wasn’t quite the end of the tunnel and once we got off the bus we had to walk through a small maze to reach our next destination, the Kurobe Dam. At the bus terminal there was a little model of the dam as well as a ticket counter and a shop or two. From there we followed some signs up some stairs and along a damp tunnel. I felt some of the flowing water and it was absolutely freezing! Once we came out we found ourselves on top of the Kurobe dam wall! The Kurobe (黒部 = Black + Part) dam was constructed between 1956 and 1963 within the gorge between two mountains on either side of the Kurobe River. It is a variable radium arch dam and at 186 metres high remains the tallest dam in all of Japan. The Kurobe No. 4 hydroelectric power plant produces 335 MW of power through the use of four underground turbines. It really was quite impressive and from the top we could really appreciate the height! One side of the was full of green water and a surprising amount of logs and the other side was a long drop down to a little outlet and trickle of a stream. Later in the year, from late June to October, fifteen tons of water per second is released from the dam. I can imagine that it would be quite a spectacular sight and we would love to see it one day. The route continued on the other side of the 492 metre long dam wall and the majority of people from our buses moved in a wave and disappeared into a tunnel on the other side. We were in no such hurry to move on. My hands had become quite cold thanks to the tunnel water and cool air but I found the perfect antidote in a bottle of warm milk! This is exactly what I had wanted yesterday! I used a vending machine to pay for the milk and gave the ticket it spat out to the lady behind a counter at the Kurobe dam rest house building. The milk was stored in a fridge but I asked for it to be made warm- which seemed to be the standard procedure. It was really delicious and quickly warmed me up! We had read in The Japan Book that there were a number of walking paths around the dam and set about trying to find them. Unfortunately we discovered that they were all closed! Thwarted again by lingering snow it seemed! While we were poking around the path entrances we looked up and noticed that there was some sort of viewing platform high up one side of the hill. At first we thought it might be inaccessible due to all the closed paths but we noticed movement inside and so we set about to try and find an alternate route up! Initially, we had a look inside the rest house and followed some promising signs but they only lead to a small museum. There was a bit of a view of the damn though it wasn’t much higher than the wall level and certainly not the one we were looking for. The museum explained a bit about the engineering and construction of the dam though as it was all in Japanese we didn't spend too much time looking around. Back outside again, I noticed some signs that seemed to indicate that we could reach an observation area by going back into the tunnel we had come out of earlier. We did so and discovered some stairs that led up inside of the mountain. There were quite a lot and every so often we found a message of encouragement stating how many steps we had left to climb! Eventually we reached the top and were rewarded with a fantastic view of the Kurobe dam and mountains! We were on the upper, open air level of the observation building which also had another lower indoor level. It wasn't very crowded at all up here, I guess since it's a bit of a climb and tricky to find. We could see the route up outside the mountain though it was deserted due to the aforementioned closed path signs. Also visible was the cause of the closers; massive amount of snow, which was being cleared by heavy machinery. Once we had satisfied our eyes it was time to turn our attention to our stomachs! We walked back down to the rest house as Kate was keen on sampling the famous dam curry. Like with the milk, there was a vending machine with buttons. I studied it for a bit and pointed out to Kate that there were dam curry options that were labelled specifically as being a lower, normal spiciness. Kate didn't really pay much attention to me though, selected the prominently pictured standard dam curry (¥1,050) and took her ticket over to the counter. While I would love to try the curry as well, I had to choose something else as I can't eat onions. I opted for some Karaage chicken and hot potato for ¥600. Both meals were a little expensive for Japan but it was the just premium for being in a remote Tourist hotspot with no competition. When I took my ticket I noticed that the number was different to what I had pressed and at the same time Kate came over with a stressed look on her face. She had tried to give her number to the people behind the counter but they didn't accept it and spoke to her in Japanese. I went over to see what was going on and was told that they will call the number on our ticket when the meal was ready. We didn't need to give them anything as the machine somehow transmitted our orders to the kitchen staff so they could prepare it directly. A short while later our numbers were called and we got started on our food! My meal was pretty basic but tasty enough and quite filling! Definitely not healthy with all that deep-fried oil! Kate was so eager to start that by the time I took a photo the integrity of the rice dam wall was already structurally compromised. The curry sauce was the water and I theorised that the two bits of chicken were supposed to be boats. Kate disagreed on the boats and noted that the curry sauce in particular would be much more accurately described as lava! Not the spiciest thing she has ever tried, by the spiciest whole meal she has ever ordered or eaten. Apparently she couldn't really taste the sauce as it burned with the piercing intensity of molten rock. On the other hand, the chicken was really quite delicious and overall Kate enjoyed her meal. Once we had finished our meals it was about 11:43am and we had to get cracking again as we'd only travelled on two out of the eight different transportation legs. We actually had a pamphlet that told us when the last service left from each location that would allow us enough time to reach the end of the route. There was heaps of time in that regard but we still wanted to do things at some of the other stops. So, we walked across the dam wall to the tunnel on the other side where we had seen people enter earlier. It had actually become quite full back then; we saw the queue extending out of the tunnel. By the time we reached it though, the tunnel was quite empty and we only encountered a small crowd right outside the entrance to Kurobeko (黒部湖 = Black + Part + Lake) Station, which is the lower station of the Kurobe Cable Car. The Kurobe Cable Car is unusual as the entire length is located inside an eight hundred meter long tunnel. The route is therefore unaffected by snow and can be used to transport people completely though a minor peak of the Hida Mountain range. The cable car takes five minutes to traverse a total elevation change of 373 metres across the length of the tunnel, and so was quite steep. Once the next cable car arrived everyone waiting in line was able to get a seat, and shortly after sitting down we took off. As you might imagine, there wasn’t a whole lot to see inside the tunnel but we could look down the steep length- which was a little scary. The car seemed very heavy and all our faith was in the hopefully thick and strong cable attached to the front. As usual there were two cable cars and half way along the tunnel widened and the tracks split into two sets so we could pass the descending car. After about five minutes we arrived at the upper Kurobedaira Station which was directly attached to our next mode of transportation, the Tateyama Ropeway. Before moving on, we climbed some external stairs up to a viewing platform on the roof of the building. The platform was quite large compared to the amount of people there and gave us excellent views of the surrounding snow drenched mountains. The ropeway was the only man made structure visible in the vicinity and spanned the valley between two mountain peaks. At the other end we could see the other ropeway station as just a little hole in the mountainside. There are actually no support towers along the length of the ropeway and the entire structure is supported by the two stations at either end. The length of this one span is an impressive 1.7km which makes is the longest single span ropeway in all of Japan. In another direction we could see down to the Kurobe River and dam where we had just been! The ropeway station we were at was only just poking out above the snow. Once we had satisfied ourselves with the view it was time to move on so we walked back down to get the ropeway. I think there were announcements so we knew when a departure was imminent and a reasonable crowd meant we did not have to wait long. It was standing room only inside the gondola though. As we pulled away from Kurobedaira we noticed that there was actually an open area where you could walk out on the snow. We were not too disappointed about missing it as we had experienced a better one just two days ago. The ride across the valley was exciting and gave us a fantastic view of the surrounding landscape. "Sorry! there's 5 steps to go"
After a seven minute journey we arrived at our next destination Daikanbo! The station was similar to the previous and its main purpose is to act as a transfer station to another tunnel. It also had an outdoor observation deck and we were able to get an even higher view of the valley we had just traversed. Again, we had to climb some stairs and this time there was a countdown letting us know how many more there were to go. Once it reached zero though there was another sign apologising and stating that there were still five to go! The deck was a little smaller and more crowded than the previous one at Kurobedaira but was tied to provide more unobstructed viewing opportunities. Even so, it was hard to not get in the way of everyone’s photos and I was actually asked to take one for someone! Down in the snow below we could see some strange squiggles and after a bit of puzzlement figured they were probably caused by a skier. Some of this snow is part of the famous Harinoki Daisekkei which is one of the three snow corridors in Japan where snow remains even in summer. Currently in mid spring though it was pretty much just snow everywhere and so I have no idea where it is located. On the other hand, I had a good idea of the names of the nearby mountains as there was a handy sign pointing them out. Once again it was time to move on and so we climbed back down from the roof to the Tateyama Trolley Bus terminal. I have some information claiming that this is the highest trolley bus service in Japan, which is true, but it's also the second lowest as there are only two in the country- both on the route. Japan just really loves superlatives the most I guess. Anyway, the tunnel cuts directly though the 3015 meter high Mount Tateyama (立山 = standing + Mountain) at an impressive height of 2450m and the electrically powered buses allow the tunnel to remain smoke free. Unfortunately they were not smell free as the naphthalene had returned, though it thankfully wasn't quite as bad as the earlier bus. The tunnel is 3.7km in length and it took us about ten minutes to travel all the way through. As with the other tunnels it was one lane for most of the length and widened half way along to allow buses coming from the other direction to pass. Unlike the other trolley bus line this one was located entirely underground. At the end of the tunnel we found ourselves at Murodo which connects to the Highland Bus service and provides the next link in the alpine route transportation chain. Murodo is a fairly major station and contains walking trails, views of the Tateyama mountain range, shops, a hydrothermal hell valley (Jigokudani) as well as Japan’s highest hotel. The highland bus travels from Murodo down to the next station, Bijodaira, through the famous high snow walls between mid-April and Early June and at Murodo it is possible to walk through them for a short distance. Upon arriving we encountered a decent crowd inside the station and outside we could see people walking through the high snow walls. We wanted to go out there to have a look too but first decided to exit out the back to see the other attractions. Continuing with the theme of the last couple of days, everything outside was covered in a thick layer of snow and it was a little tricky to walk around. I had read somewhere that there was a place you could slide down the snow on toboggans and I was pretty eager to find out where. There were some paths marked out in the snow so we set out along one of the trails. All the reflective snow was very bright but luckily we had our trusty sunglasses from yesterday to protect our eyes. While walking we appreciated the view out over the mountains down to an ocean of clouds below. It was really pretty! The paths wrapped around a lake that was a major attraction in the area and located at the bottom of a steep drop, so we had to be careful not to get too close. We could see from the path that it was almost completely frozen over and an interesting sight. We followed the trail to a building from which we could look down and see some hydrothermal activity in a “Jigokudani” (地獄谷 = Hell (Earth + gaol) + Valley). Formally it was possible to go and visit the valley though these days it’s considered too dangerous. We had a good view though from where we were and it was interesting to see how the hot steam and water had carved out a snow free area. On the way over we had actually noticed a few signs warning us about a poisonous Gus, though thankfully did not run into him. We had a peek inside the building and saw that it was an Onsen (hot spring). We didn’t venture into that part but instead entered an attached shop where I got a berry and vanilla soft serve ice cream. You could also get just vanilla or just berry. There were seats and tables inside upon which we sat so I could eat my snack. I quite liked the vanilla part but I wasn’t a huge fan of the berry and, as expected of soft serve, it was very soft. There were no toboggans at this building sadly and I wanted to continue my search and walk down to another building we could see in the distance. Kate wasn’t so keen and expressed doubt that we’d be able to hire toboggans at all. The building was located near the hell valley at the bottom of a large hill. The emissions from the valley had given the surrounding snow a greenish yellow tint. We trudged along the path and, with a little difficulty, made our way down the steep hill. There were not very many other people around and Kate expressed strong scepticism about suddenly encountering a toboggan oasis at the bottom. We pressed on though and eventually arrived at the building. It didn’t look like much was going on and it turned out to just be another onsen. I had to admit defeat at this point so we turned around and fought back through the snow and up the hill. For some insane reason on the way we decided we wanted to walk around the pond in a different direction this time. I think because there was a little less snow initially. As we should’ve expected, the snow returned with a vengeance and we realised that this way was a much longer distance. We tried to take a short cut but the snow got very deep and my feet became really cold and wet. Snow got stuck inside my boots and I wasn’t feeling too happy at all. Eventually we came to a steep decent and decided we’d probably just be better off walking back the way we had come. At the place we had turned off we saw some people who pointed out a Raichō (Japanese Rock Ptarmingan), I hope we didn’t come off to badly as we didn’t look all that impressed as we had already seen a few the previous day. Eventually we arrived back at Murodo station. Although tired, we still wanted to visit the snow corridors and made our way over to what looked like the exit. Unfortunately there was a sign up stating that it was closed and a staff member confirmed as much. I had no idea it had opening hours and we were surprised to find it already shut since it was only three o'clock. Honestly though, we were not terribly disappointed (tired) and didn't mind having to view the wall from a bus seat. So, it was time to move on and we joined the line for the highland buses and managed to secure a seat on the next departure. The snow corridors were similar to those we had experienced yesterday, but still pretty cool. I think they were also higher than Norikura's. Earlier in the year than can, on occasion, reach an impressive maximum height of 20 meters. That's as high as a six story building! There was duel audio commentary on the bus though the two languages playing were Japanese and Chinese (I think). The clouds below us looked like a white ocean and peaks of mountains poked out like islands. The road was quite twisty and although the clouds looked quite close it actually took us ages to finally sink down into the fog. As we descended we watched the snow wall gradually shrink to nothing as the amount of trees increased. At one point the bus pulled over so we could view the Shōmyō falls (称名滝 = Appellation + Name + Waterfall) and the Hannoki (榛の木 = black alder) falls which are Japan’s tallest and tallest permanent waterfalls respectively. The Shōmyō falls flow year round and are made up of four stages which, totalled together, add up to a total height of 350m- taller than Tokyo Tower! Hannoki is even taller with an impressive total high of 497 metres, but is only seasonally active between April and July and dries up once the melting snow feeding the deluge has been depleted. The driver said that we probably wouldn’t be able to see it because of the clouds but we were lucky enough to see a small part of it floating just above the fuzzy boundary. As the bus turned we got an even better look and could actually see the two different waterfalls. After a fifty minute journey on the bus we reached Bijodaira station which provides a connection to the Tateyama Cablecar. The building was smaller than the one at Murodo and contained a souvenir shop, some seats and an observation deck. Most other people continued straight on to the cable car but we thought we'd have a look around a bit instead. Like Murodo, Bijodaira has a few walking paths and we thought we might finally be able to do one without being hindered by snow. There were not that many other people around outside though someone did take our photo in front of a really wide tree. I should probably mention that we were actually still in the clouds at this point and the air was very misty. I’d say we could only see for about 100m. A short distance from the station building we found the path entrance and ventured down some steps. As we descended some guy who had entered the path ahead of us came back mumbling that it was impossible. There was a large amount covering the path! We walked down anyway to have a look. The thick fog had muffled the background noises and with no one else in sight it was really quite creepy! I tried to take a few photos though I couldn't really capture the feeling on film at all. Closer inspection of the path snow situation revealed that only covered a short bit of the path was covered and the rest looked pretty snow free. We were a bit hesitant at first, but decided to climb over and continue along the path. The atmosphere was really pretty spooky and since we were also worried about encountering a bear we agreed that we would walk for just ten minutes before turning back. The path itself was really quite nice and there were lots of straight and tall trees. Another way of looking at the fog was that it provided a cool mystical atmosphere! As promised though we turned around after ten minutes and walked back to the station. Upon returning we found that the people who had got off the bus with us had long since disappeared and there was not really any one left apart from the staff. There was a still a bit of a wait until the next cable car down so we had a look in the souvenir shop and then climbed up to the viewing platform. As expected all we could view was suspended water droplets. So we returned back to the lower floor and Kate bought some milk from a vending machine. I think she was hoping for normal milk but it was apparently very sugary. At around 4:55PM the cable car became open for boarding and we made our way back down. Since we were the only ones there we could choose any seat and decided on two right at the front. The Tateyama Cablecar descends 487m down side of Tateyama and connects to the Toyama-Chiho Railway, which we planned to catch to our hotel in Toyama City. The average gradient is 24 degrees and it takes seven minute to cover the 1.3km distance. Unlike the last cable car this one is open to the environment and it’s apparently possible to view an interesting geological feature called “Zaimoku-ishi” (Timber Rocks) on the way down. Another bus must have turned up as soon after we sat down a flood of people arrived to fill up the rest of the cable car. A tour guide and another lady sat in front of us and discussed their itinerary, so I thought they must have been part of a tour. 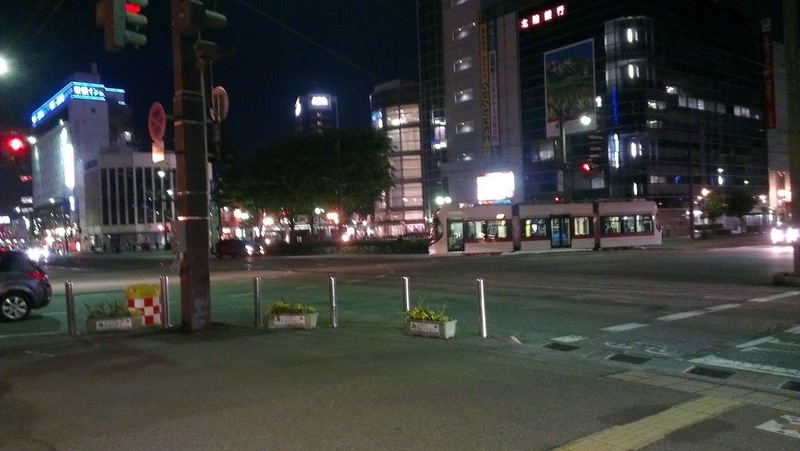 Apparently a bus was waiting for them at the end to take them to Toyama. Looking out of the window of the cable car we rapidly lost altitude and before long emerged into relative clarity, leaving the clouds behind and above us. Unfortunately I didn’t take a photo but I did observe the Zaimoku-ishi and thought they looked like Basalt columns. These rocks are hexagonally shaped such that they look like a bunch of pencils and are formed when the rock cools and shrinks- similar to the way drying mud forms hexagonal cracks. Anyway, after seven minutes we arrived at Tateyama station and found that the train already waiting at the platform! We had a super quick look around and then quickly hurried down to the platform and climbed aboard the train. It's a good thing we didn't have to worry about collecting our luggage! The train was pretty empty and we were easily able to find a seat. There was actually a drink vending machine aboard, which was a little unusual as I've only ever really seen them thus far on shinkansen and other high-speed long-distance trains. The trip through the countryside was scenic and it was really relaxing watching the view flick by from the comfort of a train. It truly is the best way to travel. After about an hour we arrived at Dentetsu Toyama station and set about trying to find our hotel. We were a bit disoriented at first as usual but soon managed to pick out the name on one of the nearby buildings. It was only a 400 metre walk away which was much closer than any of our hotels thus far! Along the way Kate bought some snacks for dinner from a convenience store. We had a little bit of trouble finding a hotel in Toyama and had ultimately settled on the Concept Hotel Wakyuu. There was no way to book it in English and we had to use the Japanese booking form on the hotels website. It was quite an unusual hotel and had many traditional Japanese elements applied to the normal business hotel concept. For example, upon arriving we had to take off our shoes and place them into a shoe box before approaching reception. The boxes had a little door on them and sliding out a wood block key would keep the door shut until we re-inserted it to retrieve our shoes. Each key and door had a Hiragana character inscribed upon it. The front desk people looked pretty apprehensive as I think they probably don't often get foreigners due to their Japanese booking system. Anyway I started with a "We have a booking" in Japanese and the guy I spoke to seemed to relax a bit and started explaining things in Japanese. I didn't completely understand everything but was able to work out most things alright. They actually knew who we were before I said, which isn't really that unusual in Japan. Breakfast was included at this hotel and we were asked to choose a time. We wanted to get going as early as possible tomorrow so decided upon 6:30am. Next we were given our key and told that there were not many amenities in the room but we were able to choose to take whatever we liked from a big selection next to the front counter. Japanese hotels always include a small toothbrush and we had gotten used to using a new one each day, so we both took one each. I also took a cool washy spongy thing. We then caught an elevator up to our room on the eighth floor. Inside the elevator a man spoke to us in English and told us that shoes are normally left on in business hotels. He said that this hotel was very unusual. The interior was nice and new and was mixed Japanese/Western style. Half of the room had tatami mat floors and the beds were on the ground, though were not futons. The blankets were really nice and fluffy. We also had the standard western style unit bathroom with a shower over bath and a nice modern TV. Kate had picked out some tea from the amenities and decided to put the kettle on. She was surprised though to find already filled with water and emptied it into the bathroom sink to refill with known fresh water. 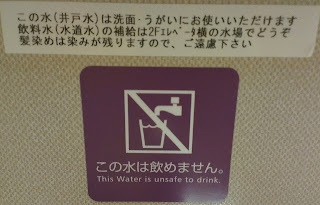 While it was boiling I used the bathroom and upon washing my hands noticed the international do not drink this water symbol displayed above some English stating that "This water is unsafe to drink". That's why the kettle was already filled with water! I think we even had another jug filled with cold water as well. I told Kate to abort the tea making and had a closer look at the sign written above. 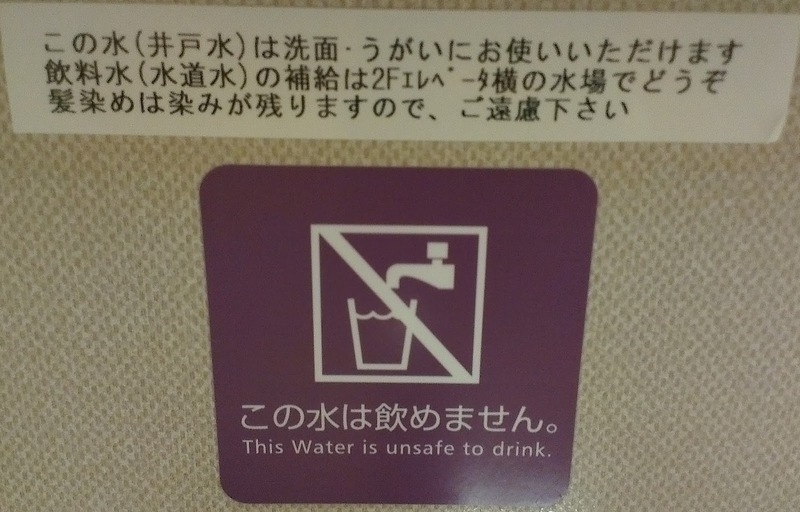 It said that the water was well water (like bore water I guess) and while safe to wash with we would have to get extra drinking water from an area on the second floor. Kate went down to investigate and came back with some big disposable cups filled with water. I wasn't completely sure but I think the sign indicated that the tap water was safe to use to brush teeth. That is, just don’t swallow it, though we didn't want to take chances so we just used the drinking water. I have no idea why potable water isn't provided to all the rooms and haven’t seen this anywhere else in Japan. Is it to save fresh water? Is it to provide onsen water to the bathrooms? Anyway, I had a shower in the bathroom and then went out to hunt down some food for myself. I ended up at a Lawson convenience store and got some simple foods (smoked cheese?) and a couple of apples. The guy who served me didn’t say anything which was pretty weird as convenience store workers in Japan usually have an almost lyrical patter as they scan, total, receive money and give change. Our hotel actually had some communal baths on the first floor and while I was out Kate went down to investigate. Apparently it was really nice inside but weird as the actual bath was pretty much just a fancy round Jacuzzi- as in really small. She said it was lucky no one else came in as they’re probably would’ve had to get married, though unlikely as she would’ve fled quick smart upon hearing someone else. She didn’t though as usual, and was able to have the whole facility (including a massage chair), to herself. Third time lucky I might add! The men’s side isn’t like this according to photos and is just a normal big bath that makes it easy to avoid others and the difference is apparently a cause of complaints from some of the female guests. Once I’d returned from the shops and Kate from the baths we got ready for tomorrow and went to sleep in our really comfortable beds. Tomorrow we will be returning to the Tateyama Kurobe area but this next time will instead approach from a completely different direction along the Kurobe Gorge Scenic railway. Also, apologies for the lateness of this post!! I'll try and get the next one out on time but we'll have too see how possible it is considering I'm already two days behind now. The report should be out Monday, 9 September 2013 at 19:07. Are you considering or have you recently travelled along the Tateyama Kurobe Alpine Route? Hi, nice trip. I've checked that the Alpine Route is open only from mid-April onwards. Did u go there in March? Is it open for visitors then? Sorry, it should read "Friday, 17 May 2013". Thank you very much for picking this up for me, I have now fixed it. You are welcome :) I'm planning a trip there in Mac and I chanced upon your blog about the Alpine Route. Thanks for the clarification. Sorry about that error, I hope you have a fun trip in March! If we will to continue our journey to Nagano, does it make more sense to get a 1-way ticket which allow us to travel from Ogizawa? Since you want to continue your journey to Nagano after, I guess you'd want to go through the alpine route starting from the Toyama. It seems to have pretty good reviews, and we like the comfort inns in general as they have good included breakfasts. It is a little budget though, but we've always found them to be clean which is the most important thing for us. Take the south exit from Toyama Station to find the hotel after you arrive from Tokyo. Then the next day you'll want the dentetsu toyama station for the alpine route, which is only a little further away (100m). Yeah, I'd get a one-way ticket to Ogizawa (covering everything in between) and then from there catch a bus directly to Nagano. I'd make sure to leave Toyama early and keep an eye on the time so you don't miss the last bus to nagano- though the last trolley bus should match up I'd say. One issue with that is that you can't bring luggage onto the route and you can't send it to Ogizawa. So on the night you arrive in Toyama I'd organise sending it to your Nagano hotel. You can probably do this with the hotel's reception or a nearby convenience store. Thank you for the wonderful blog with so much details. We are going through the same route starting and ending at exactly the same hotels in Matsumoto and Toyama. We are pleased to learn that luggages can be delivered all the way to Concept Wakyu. Thank you very much for reading my report! And also for taking the time to leave a comment! Wow, I'm surprised to hear you happened to decide upon the same hotels, we definitely thought they were very good. Though remember to be careful of the well water in Takayama. I'm sure you'll have a fantastic time in Japan! We really enjoyed the Tateyama-Kurobe Alpine route (12 June 2014) but unfortunately had lots of fog and misty rain.It was good looking at your photos in retrospect to see what we couldn't see! We stayed in Matsumoto (Dormy Inn about $95 per night...was really good, free noodles 9.30-11pm and lovely heated bath on rooftop) and went to Murodo and back. We did this with our daughter, son-in-law, and 14 month old toddler and pusher and believe-it-or-not it was still all achievable. Glad to hear you enjoyed the trip! It was a little misty at times when we were there too, especially later in the day. I think later summer (August) would be a good time to go as you'll be able to do the hikes, though it might be much more crowded during those times too. Also snow covered many things for us! Was there any snow left in June? We just got back from another trip and also stayed at a Dormy Inn, so I can agree that they're great! Glad to hear that you managed with lots of children! And thank you very much for leaving a comment!! Would like to know more about the combined ticket. I'm planning to visit from Ogizawa to Murodo round trip. Do I just tell the ticketing office for the combined ticket? I'm really sorry about my late reply! Thank you for posting this detailed account of your trip! Enjoyed reading it! I have just been to Japan and back and did the Alpine and the Kurobe Gorge routes. I wanted to say that your blog posts were really helpful. I have posted my time there on a blog as well and have linked your blog to information in my blog. I figured since you did such a great job in providing the information, I shall not repeat it. Thank you very much! I'm really glad you found some useful information. That plan seems reasonable to me, it should not be too hard to combine those two as (depending on the connection), they're only about 100 minutes apart. You can get the shinkansen to Kanazawa (from Tokyo), then bus to Shirakawago, stay the night there (in a traditional farm house), then bus back to Kanazawa and onto the alpine route. You could stay in Kanazawa the second night as Toyama (and the start of the alpine route) is only a 20 minute trip away and there's lots to see in Kanazawa. Or you could stay on the route itself which would be great, for example at Murodo. After the Apline route you can then return to Kanto (Tokyo) on the same day via a bus from Ogizawa to Nagano then a shinkansen to Tokyo. Good luck! I'm sure it'll be great and you'll have fun! Me and my friend are planning a trip to tateyama alpine route in November. Do you know the best route if we will be having tokyo-tateyama-kyoto?planning to have 1 night stay in tateyama. or do you think it is cheaper if we will be back to tokyo and just have a day trip in tateyama and we will just catch a train from tokyo to kyoto. You could do it as a day trip from tokyo, but it's kinda on the way to Kyoto so it makes sense to just continue along. It's also definitely cheaper to do it on the way to Kyoto, instead of doubling back to tokyo if you're just paying for tickets individually. If you're using a rail pass it might not matter too much though. Good luck! I'm sure you'll have a great time! Our problem is what about our bags.We don't want to carry our luggage as we go up to tateyama. We might not enjoy the good scenery. No need to carry luggage over the route as there are luggage forwarding companies. So you can forward your luggage directly to Kyoto and just take a day bag. Sorry for the really late reply, I've been extreamly busy at uni, just finished for the year though! Is it closed at the moment? As far as I'm aware it should still be open until 30 November. I've never stayed in Nagano or Ogizawa so I'm not sure what place to suggest, I think if you search on Jalan, Rakuten and Japanican and then check on tripadvisor you should be able to find something good for those places and Takayama. Hmm, It doesn't really matter too much but perhaps Takayama first then Nagano? Mainly because Nagano is a bigger town so might be more interesting if you arrive a bit late in the day. Though it would be easier to make an early start from Nagano. Make sure you leave early enough from Takayama (check train/bus times) to make it through the route though. The route is not quite free (you have to pay for the transportation) but it is very easy and there is definitely no need to take a tour. Staying at Toyama sounds good! Nice blog. Thanks for the detailed information. I will be there in mid May 2016. Do you think It is worth a night at Murodo at this time of the year since it will still be covered with snow? Hmm, I think it depends on how much you like snow. Personally while I'd love to spend a night there during summer and go hiking I think maybe there might not be enough to do when its snowy to make a night worthwhile.